Founded in 1977 , Sona has been quietly and impressively prospering. Now with interests in Printing, Paper Stationery, Education and Hospitality. New technology, innovation and continuous improvement in quality of our products and services have been our key strengths over the years to keep our customers happy. We are very proud to say that we have people, customers & business partners associated with us for very long periods some from the very starting. Our corporate headquarters is centrally located in New Delhi at Okhla Industrial Area (click here for full address & directions). 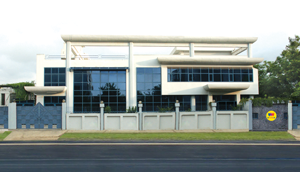 This facility also serves as the main production plant for printing & stationery divisions. We have many other offices & warehouses in Delhi and all over India. Our regional offices are in Bihar, Haryana, Jharkhand, Rajasthan, Madhya Pradesh, Orissa, Uttar Pradesh and growing. We have been printers since 1977 and now are one of the most modern Printing Presses in India with the latest and most automated equipment from the likes of Agfa, Heidelberg, Manroland, Stahl, Polar etc… The Printing Press has integrated Pre-Press, Printing, Post-Press & Bindery all under one roof giving our customers the best quality and service. For more information click here. The stationery division incepted in 1998 with a vision to serve International and National markets. The stationery plant has high capacity production machines from the likes of ECH Will, Kugler Womako and is also complemented by the printing division. Our products have been exported to many countries globally and have a very strong presence in India under the ‘Sona’ Brand. For more information click here. EDONS derived from Education-Add-Ons is a very ambitious project of Sona to bring new and innovative educational teaching methods to the Indian schools, parents and students. The division has strategic alliance and nationwide distribution from many well-known brands across the globe. For more information click here. Founded in 2008, the hospitality division’s flagship property ‘Sona South City’ is a Business Hotel in heart of Gurgaon with most modern facilities catering to the corporate travellers. Soon we will be announcing more exciting properties. For more information click here.